When we eat food that is in season, it’s often available in abundance (and therefore a little cheaper) and so much richer in taste. Foods lose flavour when they’ve been stored for a long time, whereas buying them when they’re in season allows them to provide their full, natural taste. Foods eaten in-season also contain the highest amount of nutrients; each time a plant, herb, fruit or vegetable is picked, the amount of vitamins and minerals it contains diminishes pretty rapidly. Freezing food actually goes a long way towards preserving the nutrients temporarily, but fresh, in-season and organic is always going to be the best way to truly nourish ourselves from the inside-out. In the UK it’s Springtime, which means most things are growing and there’s not too much to harvest right now. What we do have however, is very much worth including in your recipes at this time of year, due to their high-vitamin content and healing powers. The banana, apple, hemp seeds, chia seeds and beetroot are all typical smoothie ingredients and not particularly seasonal, but will provide you with the extra energy needed to get outside and be more active as the sun shines, the beetroot will additionally boost your circulation, healing any muscular damage caused by intense exercise. If you can, buy locally sourced and organic honey, as it’s known to help aid in symptoms of hayfever (especially common around Springtime!). Honey contains a lot of nutrients, and although strict vegans won’t eat the ‘golden nectar’, bees actually make 2-3 times more honey than they need. Bees are also becoming more and more endangered, so grow flowers and plants to encourage bees and keep them thriving! 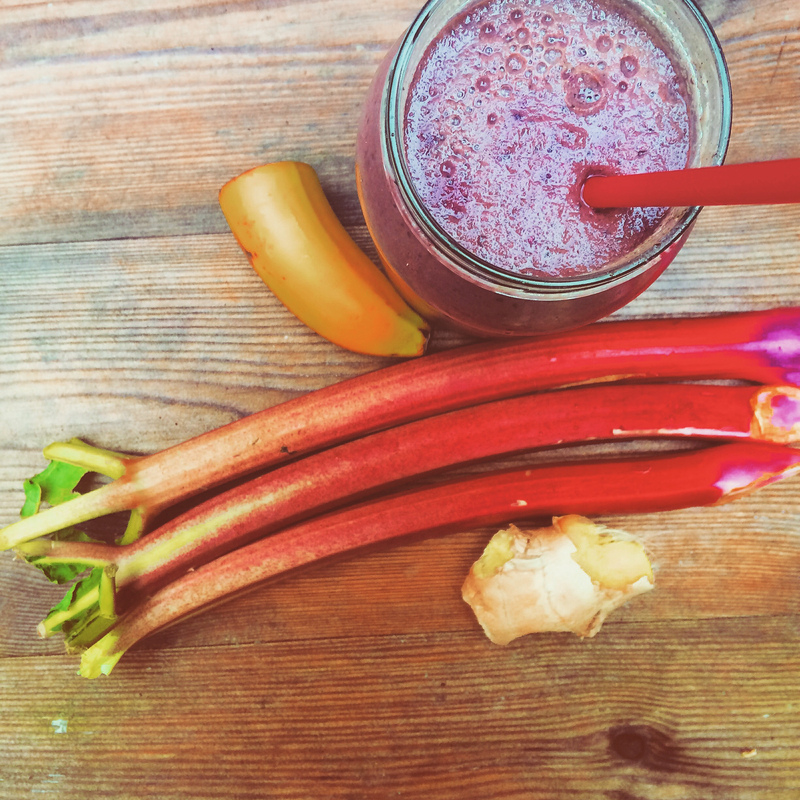 Rhubarb is extremely high in B-vitamins, important for helping us feel energised, while also containing a high amount of vitamin A, important for healthy skin membranes and eyesight. Watercress is one of the best kept secrets of the health world, and is valued even by Iron-Man contestants for both providing enough energy for an intense workout, as well as showing a great ability to aid repair and recovery – it even helps to heal injuries faster. Watercress has an incredibly high amount of iron (very important for those with anemia), higher levels of vitamin C than oranges, and higher amounts of beta-carotine and vitamin A than apples, tomatoes and broccoli! Studies have shown that eating more watercress prevents and even reduces wrinkles too…. Add all ingredients to a blender or food processor (add some water, yoghurt or non-dairy milk if needed), and blend until smooth. Pour, serve, devour and take on the day!